Last month, I designed and posted a fractal maze. I'm not sure that anyone could solve it. Haha, sometimes I get a little overzealous with my puzzles. Rather than posting the solution, I'm going to explain how I designed the maze. If you understand the process, it will provide insight into how to solve it. When designing this maze, drawing out the maze was the last step. The first step was to consider the maze more abstractly, and decide what would connect to what. So I decided that there would be two smaller copies of the maze, called A and B. Each copy of the maze can be specified with a finite sequence of As and Bs. For instance, if I go down a level into B, and then down a level into A, this can be described with the sequence BA. But to fully describe a position within the maze, we need more than just As and Bs to specify which copy of the maze we're talking about. We also need to specify where we are within that copy. So I decided there would be two checkpoints, called 1 and 2. From each of these checkpoints, there is a set of actions you can take to move from one place to another. For instance, starting at position 2, you can go down A, down B, and end up at position 1. I denoted this action as 2-AB-1, because it starts at 2, ends at 1, and goes down AB. Some of the actions would also go up a level. I denoted those with inverse notation, like A-1. Note that you can also take any of these actions backwards. And with this simple list of eight actions (some of which are redundant), I was practically done! The rest was just a matter of presenting the above in a somewhat aesthetic fashion. Following my discussion of Boltzmann Brains, I wanted to mention its relation to yet another argument for God. The argument goes that a low-entropy initial condition is extremely unlikely unless God exists. Therefore, God probably exists. My response is that we don't know that the initial condition is extremely unlikely. It's only extremely unlikely if we assume all microstates are equally likely initial conditions. Also, saying that we do not have an explanation is not the same as saying we do have an explanation and we call that explanation God. Let's say that I have a differential equation that I can't solve (a common scenario in physics). A common practice is to posit the existence of a solution and call that solution something like the Bessel Function or the Legendre Function. But I can't posit a solution and call that solution God. Got the distinction? The analogy isn't perfect though; in differential equations we have existence theorems, in metaphysics we do not. Rationalist atheism does not claim that science has all the answers, but rather, that religion has none of the answers. In a previous post, I discussed the proposition that all the world is a coherent dream. This is basically the ur-example of pointless philosophical exercises, but I promised that it has applications in cosmology, to be explained now. Let's take a closer look at the Second Law of Thermodynamics. The Second Law says that the universe tends towards disorder as time progresses. More precisely, it tends towards a state of higher entropy, where "entropy" is a precise measure of disorder. In any basic statistical mechanics class, they'll tell you that the Second Law has perfectly logical justifications. First we need to understand that every physical system has a large number of possible configurations, called "microstates." Some of those microstates look more or less the same. For example, it doesn't matter if a particular molecule on my nose is moving to the left or to the right, my nose still looks the same to me. On the other hand, there are some microstates which look different. If the right half of my nose has significantly more energy than the left half, I can tell that one side of my nose is cold and the other is warm. A "macrostate" is a collection of microstates that all look more or less the same. Some macrostates consist of more microstates than others. 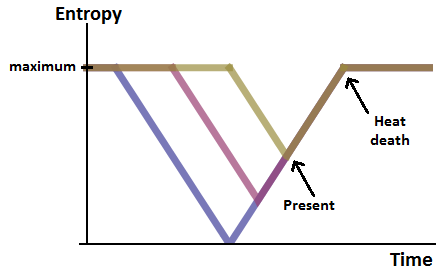 Entropy is a measure of how many microstates there are in the current macrostate. The Second Law rests on the Ergodic Hypothesis, which says that all microstates are equally likely in the long run. Therefore, in the long run, we're more likely to be in macrostates consisting of more microstates. In other words, in the long run, we're more likely to be in a state of high entropy. That's why entropy increases as time progresses. But there's a problem with this "perfectly logical" justification of the Second Law. The Ergodic Hypothesis and the Second Law make very different predictions. According to the Second Law, the universe starts at some low entropy state, and entropy increases throughout time. 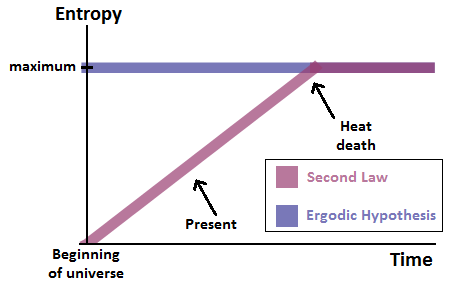 Eventually, the universe reaches the maximum entropy state (called the "heat death" of the universe). This does not agree with the Ergodic Hypothesis, which says that the universe would be in the maximum entropy state to begin with. But hold on! The Ergodic Hypothesis doesn't say that the universe has to be in the maximum entropy state. It just says that all microstates are, in the long run, equally likely. At least some of those microstates have lower entropy. Therefore, the universe will occasionally fluctuate into lower entropy states. Perhaps such a fluctuation accounts for the observations we see now. Such a fluctuation seems extremely unlikely, but we could argue, by the Anthropic Principle, that we just weren't around to see the vast majority of the timeline in which there was no large fluctuation. Let's try out our new hypothesis, which is the Ergodic Hypothesis plus fluctuations. The first thing we want to figure out is how large the fluctuation was. The above plot is a comparison of three different fluctuation sizes. The fluctuation could have been big enough to account for the entire universe. Or it could have been just barely big enough to account for our present observations. The probability of a fluctuation decreases exponentially as the size of the fluctuation gets larger. So the most likely explanation for our current observations is that the fluctuation was just big enough, and no bigger. Any signs that the universe used to have lower entropy are illusory. Taking this conclusion to the extreme, I must be a brain that spontaneously assembled itself in such a way that it just thinks that it lives in an ordered universe with things like blogs and the internet. This brain is known as a Boltzmann Brain. We can draw a comparison between Boltzmann Brains and the dream hypothesis. If the world were just a dream, then most likely, it is a dream which is just coherent enough to explain our observations. If the world were just a statistical fluctuation, then most likely, it is a fluctuation just large enough to explain our observations. The problem is that this makes very strange predictions which are perpetually falsified. The dream hypothesis predicts that as we see more of the world, it will no longer be coherent. The Boltzmann Brain hypothesis predicts that only part of the universe is ordered: the part we currently occupy. As we look out to the sky, to a part of the universe that we have never seen before, we would predict it to be in a maximum entropy state. But everywhere we look, we see stars that have not yet burnt out. When we consider the dream hypothesis, something is not right about it. So we reject the dream hypothesis. When we consider the Ergodic Hypothesis, something is also not right. But we need the Ergodic Hypothesis! It explains the Second Law of Thermodynamics. Cosmologists understand that the Second Law arises from two principles. First, all accessible microstates are about equally likely. 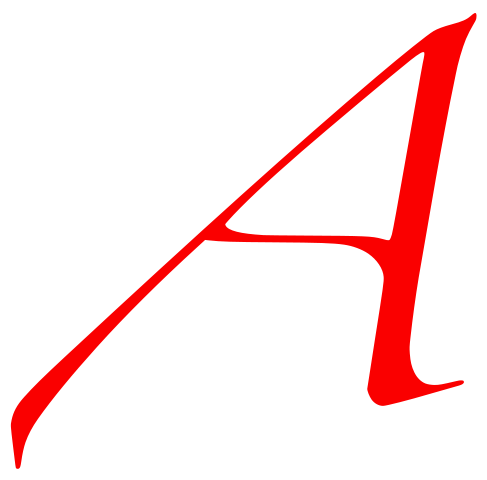 Second, the universe has an initial condition which is highly ordered. But why? Is a large fluctuation not as unlikely as it appears? Perhaps there is no maximum entropy state, and new baby universes are formed repeatedly throughout history? It's an open question in cosmology. My dad (who you may address as #1 Dad) volunteered to write a guest post about his side of the story when I came out as gay. Enjoy! This is Miller’s father, giving a different perspective about my son "coming out". My comments here may not make me sound as accepting as my son makes me out to be, because I have to say I wish he was not gay. My son said that parents are the hardest people to tell. Well, the hardest person to accept as being gay is your child. I wish I knew when someone becomes gay. Is someone born that way? Is it early in childhood, or during puberty, or at the age whenever they realize they are gay? This last age seems to vary quite a bit between individuals. I don’t know if it was just coincidence, but I wondered about my son at age 7 already, when he seemed a little confused. But maybe a lot of 7 year-olds are confused. When Bill was in middle school, he had a girlfriend, and I was relieved. I felt silly for ever having worried. For high school, as he has mentioned on his blog, he went to a Catholic school, which was all boys except during summer school. Was that a mistake? Everybody relates to their own life best, and as for me, I definitely was very interested in girls before high school. I don’t think any high school could have changed that. From near the end of high school through most of college, I kept wondering if Bill would tell me a secret. I didn’t ask for a long time, because if it wasn’t true, then he might take it as an insult. He says now he didn’t know it himself in high school. Considering Bill’s family, going back 3 generations on either side, including brothers, sisters, cousins of parents, grandparents, etc., there are a lot of religious conversions. It seems that roughly half change their religion/religious affiliation during their lives. Many change upon adulthood or upon marriage. The idea that people or born, marry, and die in the same religion just doesn’t seem to apply to life in a big American city, and Bill grew up in Los Angeles. For Bill’s ancestors/relatives, from Asia and small-town America, it didn’t always apply either. So I never had strong expectations that all of my children would remain in the same religion their whole lives. When Bill came out as an atheist, I almost told him that one day when he had children, he could not expect them to always have the same beliefs he had. But I was already wondering whether he had another secret, which would make children less likely. To me, this would be a revelation much harder to take. Finally, after months more, I just asked him. When I told my wife, his mother, that Bill was dating someone, her first words were, “Is it a girl or boy?” This took me by surprise. I never knew she had the same suspicions. I soon told Bill about a girlfriend I had as a teenager. One day she said to me, “I like boys, but I like girls, too”. That just weirded me out. Especially since neither one of us ever heard of bisexuality. I thought I had the strangest girlfriend on earth, and even she thought she was odd and was trying to determine whether she was a lesbian or not by reading books on the subject. We broke up soon after. I was too embarrassed to tell anyone why. After Bill told me, I told other people about my gay son, but not people who know Bill. These were people closer to my age. The first told me his sister was a lesbian. The second told me he was glad that stage in his life was over, when he was figuring things out. (What did that mean? He is married to a woman now.) The third told me she was very concerned that she would hear the same thing from her own son. The fourth told me her cousin was gay. So this was easier than I expected – does everyone have a gay relative? I haven’t mentioned asexuality. I suspect many people are that way, especially many who never marry, and no one holds that against them. I stayed up a bit late last night studying quantum rotations, so when I went to sleep I was thinking about Euler angles. Actually, before I fell asleep, I woke up twice thinking, "Oh no! I rotated that axis the wrong way!" and "Oh no! I left a dish in the public kitchen!" Sometimes things get stolen if I leave them in the kitchen, see. Anyways, at some indeterminate time last night, I sort of woke up again, and I couldn't move. I thought someone had broken into my room and was pinning me to my bed. I even thought I saw him, though my bed sheet was mostly in the way. I think I tried to say, "Hey!" but I couldn't speak either. That lasted about five seconds, then I could move again. And then I thought, "Oh, sleep paralysis," and went to sleep again. I don't know much about sleep paralysis, except that it occurs when you are falling asleep or waking up. Subjects usually get the feeling that some conscious agent is involved, though the nature of the agent is culture-dependent. It's not surprising that I interpreted it as an intruder, since the previous night, my apartment residents were talking about someone who keeps stealing food from the refrigerators. But many past cultures have interpreted them as demons, and in more modern times, as alien abductions. Alien abduction is one of those classic skeptical topics discussed by Carl Sagan in The Demon-Haunted World. Though we rarely have to deal with alien abduction claims, I feel that it's still an extremely important demonstration of some skeptical concepts. Alien abductions are one of those paranormal claims which really do have something to them. It's not quite so extraordinary as aliens performing live dissections, but sleep paralysis is pretty amazing too. Anyway, when countering alien abduction claims, it's important to affirm the reality of those experiences. People have a bias against believing anything unflattering about themselves, so if you tell them that their experiences are fake, they'll reject what you say. But it's not just a matter of strategic positioning, it also happens to be true that the experiences are real. Alien abductees aren't liars. And for the same reasons, it's important to emphasize that alien abductees are not crazy either. Sleep paralysis is actually fairly common, and it's frequently accompanied by convincing hallucinations. I've only experienced it once or twice myself, but I have friends who've had it more often. One of my friends says she gets it like once a month. It's usually quite a scary experience, though it's not as bad as night terrors, which she has much more often. Once she showed me a picture she drew to help her deal with night terrors. It was a picture of a demon making photocopies instead of trying to kill her. Frequent sleep paralysis probably constitutes some sort of sleeping disorder if it interferes with one's sleep, but it's silly to think that it makes someone a worse person in any way. One of my friends asked me what I think of the idea that we're just living in a coherent dream. There are two different responses to this claim. The first is to say that it's uninteresting, because it makes no predictions which diverge from a more typical view. So why should we care? However, I would take a different tack. I think that this claim is uninteresting, because it does make predictions, and those predictions are perpetually falsified. A false claim is not very interesting, and this one appears to be fantastically false. This seems like a rather pointless philosophical exercise, but I want to go through the reasoning because as I will explain in a later post, it's relevant to theoretical physics! Let's take the assumption that all the world is a dream. There are all sorts of dreams it could be. Relatively few of these dreams will be coherent; the vast majority will be incoherent. However, as I can see around me, the dream has been at least coherent for the duration of my life. So I can eliminate a lot of possible dreams that the world could be. Of all the possibilities left over, a few will be coherent, but the vast majority are only briefly coherent during my life so far. So given that the world is a dream, I predict that the dream will descend into incoherence in the next instant. Hypothesis: The world is a dream. Prediction: The future will be incoherent. Results: It still looks coherent to me. Conclusion: The world is not a dream. If you were paying close attention, you might have noticed that I snuck in an extra assumption there. I was implicitly assuming that all possible dreams are equally likely. How do we even enumerate dreams? It's not clear to me that the set of all possible dreams is a countable set. Furthermore, even if we did enumerate them, why should we believe each one equally likely? This is not true of real dreams. We have semi-coherent dreams all the time, even though there are a lot more ways for dreams to be completely incoherent. Another one of my friends objected to the very idea of assigning probabilities to the different possibilities. Probabilities apply to ensembles, and all we have is the one universe. He's arguing from a frequentist interpretation of probabilities, while I very consciously apply a Bayesian interpretation. From a Bayesian perspective, we need to start with some prior probabilities of the different dream possibilities, and from these we make our predictions. From a frequentist perspective, probabilities apply only to ensembles, so prior probabilities are invalid. I'm extremely partial to Bayesian statistics, but a good Bayesian knows that you should vary the prior probabilities to see if the conclusion is robust. So... if all possible dream are equally likely, then we predict that the future is almost certainly incoherent. This prediction is false, so the claim is false, and therefore uninteresting. On the other hand, let's say that not all possible dreams are equally likely. Let's say that the dream will most certainly be coherent. Then the claim is uninteresting because it makes no predictions. So either way, we conclude that the claim is uninteresting. One wonders why I ever blogged about it. As we'll soon see, very similar reasoning can actually be fruitful when applied in cosmology. Today is National Coming Out Day! As you may have known, I am already quite out, not just online but offline too. I came out last year, first by blog, then to a few friends, then on Facebook, and then at loud parties, then in public restaurants, then in... well, you get the point. I'm also in the strange circumstance of having to come out to many people twice, as gay and asexual. Sometimes this is just because it's assumed (for example, if I refer to my boyfriend), and other times it's just because I don't tell the whole story. And I probably contradict myself sometimes too. I guess as a man of reason, that's something I'm not supposed to do? But it's okay, because where I draw the line between gay and asexual is pretty arbitrary anyway. Since I'm already "out of the closet", what's the point of Coming Out Day? Isn't that over and done with? Not really. Contrary to what the closet analogy might suggest, you never really stop coming out. We've all known hundreds to thousands of people in our lives, and there's a constant flux of new people. You'd think you can come out to all of them on Facebook, but a lot of people don't pay attention. How it ends up is that you just can't keep track of who knows and who doesn't. There are political reasons to come out (knowing a someone you know is gay is the best indicator of social acceptance), but I also advocate it for personal reasons. I feel that when you come out, you don't just become more confident about the coming out process, you also become more confident in general. Note that, just because I'm really out, that doesn't make me some kind of coming out expert. I think mostly I just have it ridiculously lucky. My parents are accepting. Most of my friends were either physics or skeptical enthusiasts, and they were all college-age. What's more, because I already had the experience of coming out as atheist, I had already built a lot of the necessary confidence, and I already knew my parents would be accepting. Oh boy, I've always wanted to design one of these! It's a fractal maze! 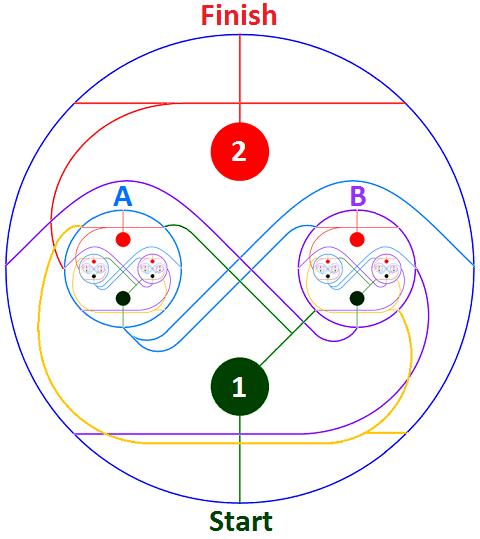 Both of the circles on the left and right represent copies of the entire maze (excluding the start and finish lines). The circles labeled 1 and 2 are meaningless, they're just checkpoints to help me design the maze and you solve it. My goal in designing this maze was to make it very difficult if you have no idea what you're doing. Let's see if I achieved that. You can send your solutions to skepticsplay at gmail dot com. Note that while this is an original fractal maze, the idea of a fractal maze is not original. You can find multiple examples of fractal mazes on the internet, usually with a microchip motif. A solution will not be posted, but I've had some discussion which should provide hints. Happy Birthday to Skeptic's Play! You are now three years old, which is something like 30 in internet years. Ignoring units, that's older than me! Skeptic's Play currently has 536 published posts, and somewhere around 2000 comments. Since last year, there's been a site redesign, a few shifts in focus, and I've moved on to grad school, but it's still the same old blog with different words on it. Like in previous years, I will celebrate this bloggy day in the most boring way imaginable: a "best of" link list! The next blog-improvement project is to add a permanent "Best of" links page. But maybe I should get some input on this. Do you have any favorite posts in the archives? Then, move to the right at max speed. As far as I know, this is the fastest possible program.